The satellite communicator that allows you to type, send and receive, track and SOS all from the palm of your hand! 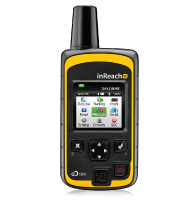 If you’re going off the grid, stay in touch with inReach™. Now you can both send and receive messages — that means interactive SOS messages, text messages, emails, social network updates and GPS tracking. In short, an affordable remote satellite connection that is no less than revolutionary. • Send and receive free-form, 160-character text messages outside of mobile phone range. • Trigger an SOS and interact back and forth with GEOS, our 24/7 search and rescue monitoring centre. • Turn on tracking to share and view GPS coordinates. • Colour screen and virtual keyboard with predictive text. • Intuitive LED indicator for satellite availability. • Post to social media. 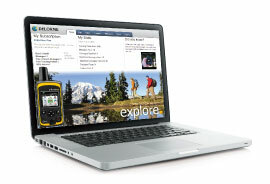 Like our original inReach, inReach SE can be used in conjunction with DeLorme's Earthmate app on a mobile device and our Explore web portal. 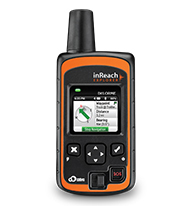 When paired with your mobile device, the capabilities of either inReach product is enhanced. Previously downloaded map data is only accessible during paired mode. Pairing inReach allows you to use your mobile device to send messages from the Earthmate app. Transform your smartphone or tablet into a global satellite communication and navigation tool with our free Earthmate app. Experience worry-free navigation and journey tracking with unlimited access to downloadable topographic maps on your bluetooth paired mobile device. Automatically sync your mobile device's address book for easy texting. 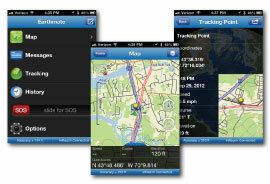 • Share your location and trip details with MapShare, including tracking and GPS information. • Invite others to "ping" your inReach to see your location, activate tracking & exchange msgs. 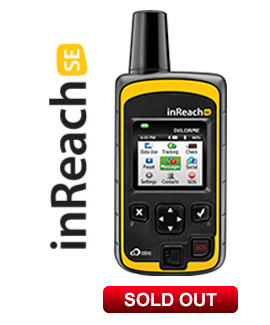 • Load preset messages to your inReach. • Manage your account & settings, inc. emergency contacts. iPad 2, iPad, iPad mini and iPod touch (3rd, 4th and 5th generation).